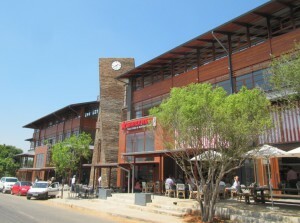 Craighall Park is a restaurant haven – not only are there many excellent restaurants in the suburb itself, see http://www.lizatlancaster.co.za/info/eating.html, but the neightbouring suburbs of Parkhurst and Parktown North are also renowned for their wide choice of eateries. If you amble along 4th Ave Parkhurst (between 14th St and 6th St), you’ll find loads of café style restaurants, burger joints as well as sophisticated fusion fare -and without exception all have outdoor tables (pavement, patio or rooftop). For more detail on menu offerings check https://www.zomato.com/johannesburg. In addition, Liz at Lancaster’s information booklet in each room has a map, plus full contact details and addresses of each restaurant. Craft is one of the most popular 4th Ave restaurants – guests staying at Liz at Lancaster have raved about it. There are 2 burger places: Hudson’s Burger Joint in Parkhurst Square and The Wolfpack – a buzzy burger bar run by the same owner who started Cnr Café. 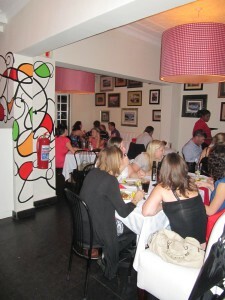 Also in Parkhurst square is Café del Sol Tre, the third restaurant in the Café del Sol brand. 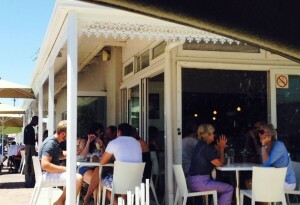 The Olivedale Café del Sol has an excellent reputation so it’s worth giving this one a try. 011 568 1063. Nextdoor is a Mexican Restaurant Salsa which is probably better for larger groups rather than small intimate dinners. 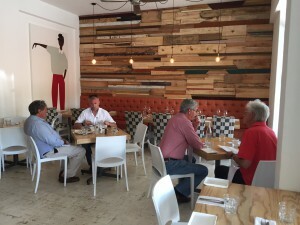 Vovo Telo in the Cobbles Centre started as a bakery (in a domestic kitchen in Port Elizabeth of all places) – they still make fabulous breads – but quickly grew into a bistro serving light meals. It offers excellent value and is always buzzing. If they are full, they will take your cell phone number and you can browse along 4th Ave and they will call when a table becomes free. Now that’s what I call customer friendly. Espresso is consistently good. But note they are cash only as they do not accept credit cards. Bottega is a very small restaurant with excellent bistro fare – pastas, salads, open sandwiches as well as more substantial meals. They open every night so good for Mondays when so many other places are closed. At Rockets provides excellent gastro-pub fare. Really good hamburgers and thin crust pizzas, delicious baked potatoes with scrumptious fillings, a wide range of salads and entree dishes. 011 880 6102 Cnr 4th Ave and 10th St. Finally on 4th Ave is the pub (more of an institution) – The Jolly Rodger, known affectionately as ‘The Jolly’. It’s a good place to watch sports along with Giles in Grafton Ave Craighall Park (which is way more sophisticated! ). It’s linked to Jolly Cool opposite which is open till late for things more substantial than beer and chips! Stay at our well located Guest House and experience beautiful Johannesburg. View our Johannesburg Guest House for Rates and Availability! Just up the drag in neightbouring Parktown North on the corner of 4th Ave and 7th Ave ((Joburg has to be the only big city where you can have an address corner 3rd Ave and 7th Ave .. go figure??) is the new trendy place – Il Contadino run by James Diack of the National fame (almost next door) and also part of Coobs in Parkhurst. A block further up in North Park Centre are two renowned steakhouses: The Local Grill for really excellent steaks (closed Sundays & Mondays) and the Turn and Tender which, according to our review book has the ‘best steaks around’. And the best thing is that it’s open daily. Next door to the Turn and Tender is the Foundry which calls itself a gastro-pub offering a bistro type food and a selection of local ‘craft’ beers. It’s open Mon – Sat from 11am – 10pm and Sundays lunch only. Very popular with the upwardly mobile for after work drinks. Also in NorthPark Centre is Sushi on the Move standard conveyer belt fare where you pay according to the colour of the plate on which the portion is served. Also Simply Asia for basic noodle fare. Newly opened is La Boqueria run by the same owners as the The Foundry. Inspired by their favourite market foods from around the world, they cook on live fires and wood ovens. It’s had excellent reviews. La Cucina di Ciro further east 7th Ave (no 43) is owner run (very independently!) by Ciro; small varying menu; excellent Italian food but not cheap! Wonderful puddings. Open for brunch and lunch every day except Sunday; open for dinner Wednesday to Friday. 011 442-5187. Opposite Ciro’s is Full Stop Café which, like Ciro’s is in a converted house. They serve wholesome food – nothing to write home about but it’s a good stopgap. It has a nice ambience with fun informal décor and a very attractive outdoor area under the trees around an open lawned area. Lovely on a summer’s evening or warm winter’s day and they also have brazier fires in winter. And you won’t have to struggle to park as they have designated secure parking in a lot on the opposite side of the road. Workshop 55 is a tapas & gin bar which operates slightly differently. They charge an entrance fee currently (late 2015) R180 which includes 3 items from the tapas menu with additional dishes charged @ R40. 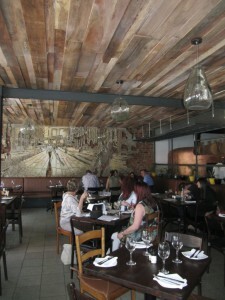 For top Illovo eateries see Johannesburg In Your Pocket’s recommendations. Now you can see why these`burbs in the Parks are renowned for their pavement café culture and wide choice of good quality places to relax, chill and have a great meal.